Free Raised Bed Soil Guide + Weekly Tips for Your Garden Journey! Yellow Leaves at the Bottom of Your Tomato Plants? My tomatoes always seem to start out strong, I believe partly due to my mixture of manure, compost, and organic fertilizer. Every year I hold my breath, waiting for the first green fruits to catch my eye. But no sooner do I start seeing those baby tomatoes do I also notice the bottom of my plants turning yellow. Many leaves also have brown spots. Why do my tomato plants always seem to have yellow leaves at the bottom? And what can I do about it? 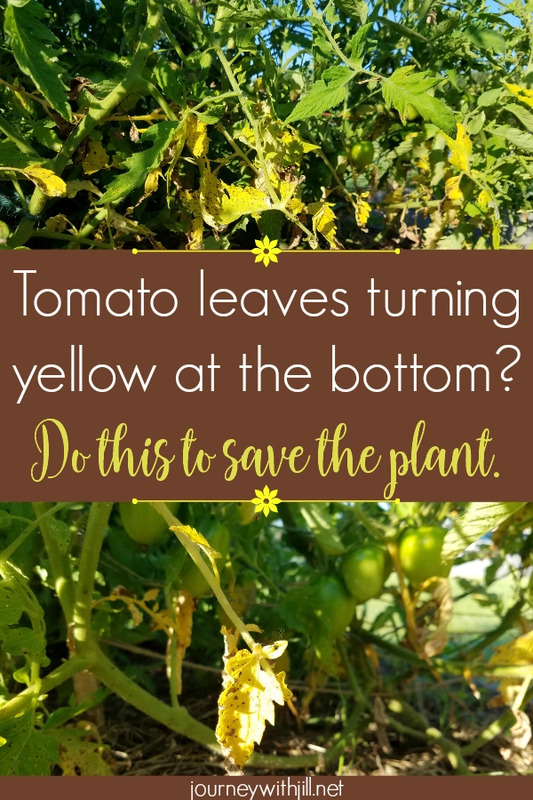 When the bottom leaves of a tomato plant turn yellow with brown spots, early blight is usually the culprit. Early blight is a fungus that occurs and spreads in wet and humid conditions. Since the fungus originates from the soil-level, early blight begins on leaves toward the bottom of the plant. When rain splashes on the ground, the fungal spores attach to the low-lying leaves. How Do You Stop Early Blight? Not wanting to use fungicide mainly because I can be lazy/cheap and don’t want to buy it, I go a different direction. I simply cut off the yellowing stems. Not only are the lower leaves shaded most of the time, I also know that by cutting these leaves off, I could inhibit the pathway for the fungus to reach the rest of the plant. Though I still have a few issues with the yellowing leaves during the season, for the most part (thanks partly to a the hot and dry summers we usually have) the plants rebound and produce healthy red tomatoes. Clip stems as soon as you begin to notice the yellowing of the lower leaves with brown spots. If you let them stay on the plant, the fungus will travel up the plant. By catching it early, you won’t have to take away too many leaves and stems. Clip the lower leaves, even if they’re unaffected. When the plant reaches about 18″ high, clip all stems growing on the lower 6″ of the plant. As the plant grows higher, aim for no stems on the bottom 12″ of the plant. If the leaves are allowed to touch the soil, early blight will continue to spread. Mulch thickly. Since early blight originates in the soil, inhibit its path to the plant by laying on a 4″ layer of mulch around the tomato plant. My preference is wood chips, but I also have used other methods as well, as I talk about in this post. Continue checking for yellowing over the next few weeks, especially after a rain. Tie up any stems touching the ground, even if they are healthy. They run the risk of being affected eventually. A good tomato trellis should eliminate this step. Can early blight be reversed? The yellow leaves will not return to green. Once a leaf is affected, there really isn’t hope for that leaf and even that stem. Cut it off as quickly as possible to stop the spread up the plant. Most likely, your upper leaves — which receive the light anyway — are still healthy if you caught it early enough. Grow Ingredients for Fresh Salsa! Do you want to make delicious, homemade salsa from fresh-picked ingredients you grew yourself? In this guide I will teach you how to grow a salsa garden, from planning to canning, and everything in between. Enter your e-mail address and I'll send you this 28-page download for free! Plus, I'll send you my "In the Garden E-mail" on Fridays, periodic updates on garden resources relevant to you, and you'll get access to my entire bank of free garden downloads! Success! Now check your email to confirm your subscription, and your guide will be on its way! Mine do this every year! I always figure I should try a fungicide, but that makes me fear I’ll damage the rest of the plant in this heat. I just do what you suggest – clip off the stems and keep on trucking. I don’t have any red tomatoes yet, but lots of green so far – and maybe a few fruit worms too… 🙁 Can’t win ’em all! I’m right there with you. I’d rather not start applying fungicide if I can help it! I bet those green tomatoes will turn red soon! Mine just started this week. I haven’t seen any worms yet, fingers crossed! How many tomato plants do you usually grow? Just curious. I have 6 Amish Paste plants in a raised bed, and in my regular garden I have about 6 Roma plants and 10 Hungarian Heart plants. The ones in the raised beds always produce more than in the garden, as I’m working on getting my garden soil in good shape, which can take years. The ones in the raised beds produce half if not more of my total harvest each year, no matter which variety I plant in them. I haven’t had any trouble with worms so far with tomatoes. I’ve only seen one tomato hornworm in my 4 years of gardening, thankfully! On my tomatoes and it always looks like it needs water the leaves are drooping I had one tomato and it was small what do I do? It’s hard to know what the problem might be. If you are growing in a container, it’s possible the container isn’t large enough and the plant has become root-bound, not able to retain and intake water fast enough. If you’re not growing in a container, tomato leaves can droop with too much water just as they can with not enough water. Ensure the plant is getting 1 inch of water per week but not much more than that. Again, I’m just making guesses based on what you’ve shared. I hope this helps! Thank you so much for the early blight Tip. I’ve been wondering what’s wrong with our tomato plants, and stumbled upon your post randomly today. I will definitely clip those leaves! Thanks again! here in Ireland we have a long history of blight (irish famine caused by blight on potatoes) we use a lime wash that has been mixed in a copper container. This gives a blue cast on the leaves but will stop blight in its tracks. Interesting! Does this lime wash come prepackaged or do you create it yourself? Hi! I'm Jill McSheehy and I'm so glad you stopped by! If you're a beginning gardener needing help getting started or an everyday gardener looking for new ideas, you're in the right place! You'll find gardening articles, The Beginner's Garden Podcast, and more! To learn more about me and follow along in my journey, visit "Meet Jill" here, and subscribe above for instant access to all of my free gardening downloads, plus my Friday e-mail full of relevant gardening tips and ideas to help you grow your best garden! Some links on this site are affiliate links, which means I may receive a small commission if you purchase products I recommend. This does not cost you any more but does help me offset some of the costs associated with this blog. I only promote items I personally recommend and think provide benefit to my readers. Journey with Jill is a participant in the Amazon Services LLC Associates Program, an affiliate advertising program designed to provide a means for us to earn fees by linking to Amazon.com and affiliated sites.